At the end of 038, when the female dancers are taking a bow and getting a very warm reaction from the crowd, one of them blinks back tears. No one has revealed any emotion on their face during the 40-minute performance, so the human chink in the armour is an accidentally touching ending. The title is the area phone code for Hualien on Taiwan's east coast. 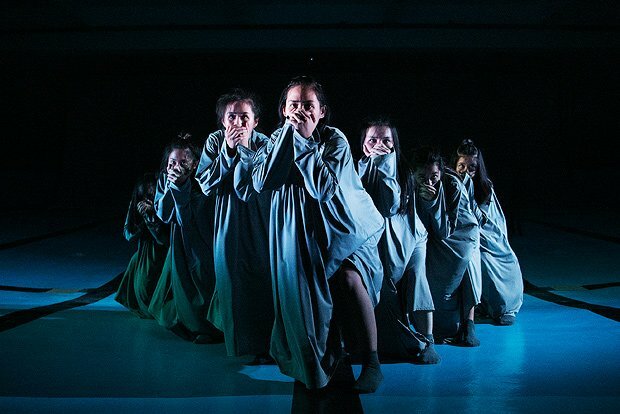 It's home to the Amis aboriginal people, including the show's director, Kuo-Shin Chuang, who studies and teaches traditional Taiwanese dance styles. The nine dancers, all experts in controlled precision, have trained with Chuang since they were children, and inspired the choreography. Most of the dancers live in cities now, but are pulled back towards rural Hualien to rehearse every month. There's an angsty tension throughout, where twitchy, jerky moves give way to softer, floppier shapes near the end. The cold anonymity and relentless pace of the city is portrayed with robotic tiny steps, and exhausted movements in rows and lines. As images of Taiwan's rolling mountains and sounds of lapping water bleed in, the manic marching slows, and the dancers link arms, hugging, eyes still staring out. The tight formations and mechanical choreography that preceded it making the homecoming payoff feel even more welcome. Dance Base, until 27 Aug (not 21), 3.15pm, £10–£12 (£8–£10).